Spring is in the air and that means thousand of "for sale" signs will soon sprout up on lawns across Metro Detroit! (WXYZ) — Spring is in the air and that means thousand of "for sale" signs will soon sprout up on lawns across Metro Detroit! Whether a first time home buyer...trading up or downsizing...of course, you want to get the biggest bang for your home-buying buck. 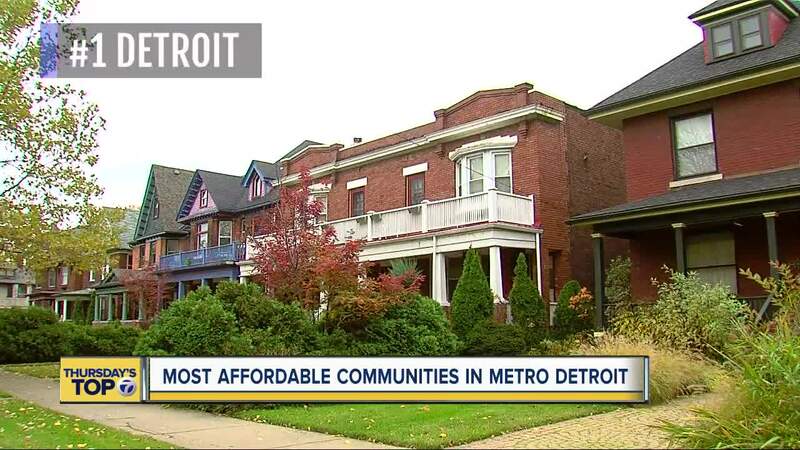 In our Thursday's Top 7 we're breaking down the 7 most affordable communities in Metro Detroit. Real estate site homearea.com compared the cost of a community's average home with the average income to see how long it would take to pay of your home. Rochester Hills comes in seventh. This bedroom community routinely places near the top of the best places to live in metro Detroit. Sterling Heights is sixth. In addition to affordability, Sterling Heights offers people who live there one of the best parks in the area, Dodge Park, which topped our list of best parks in metro Detroit . Warren is Detroit's largest suburb. It's home to the GM Tech Center and Detroit Arsenal, so you can afford to live close to thousands of jobs, and that means a short commute. Southfield says it's "the center of it all." People who live here can easily access several metro Detroit freeways to easily get around metro Detroit. Westland lands in third. Hines Park runs through northern Westland and it's a great place to walk and play. Livonia is right next door to Westland and comes in at No. 2. It boasts the lowest total tax rates in Wayne County adding to the affordability. It has more parks and nature preserves than another community other than the one at No. 1. Detroit also tops our list of the most-accessible cities to buy a home. It's definitely more affordable, but these days, the draw is more than saving money. Emily Rucker is saving for a home, and said Detroit homes are really good quality, and there are more of the older ones that are better built. Tim Rohrschneider moved to the city, and said he loves being downtown. Home prices in Detroit are increasing steadily, and according to mortgage broker Anthony Kellum, some of the best neighborhoods to invest in for the long term are Sherwood Forest, Eastern Market, Rosedale Park and Island View. Other neighborhoods in the area include: Sherwood Forest, Rosedale Park, Boston Edison, Green Acres, University District, Indian Village, Palmer Woods, Grandmount, Island View, East English Village, West Village, Midtown, Corktown, Eastern Market, Downtown.